Participants were invited to reflect individually about a time when they felt proud of CIAT as an institution and as a research center, and when they felt happy and proud of working at CIAT. Those Appreciative Inquiry reflections were shared in small groups and summarized on cards. Each group took then time to write a story. Pretending being in 2012, participants imagined the path that CIAT went from now to 2012 and that led CIAT to be a successful research center. The stories were based on the individual reflections of participants “happy moments”. They are interlinked and have many connections. Let’s see what participants think? Nancy will work further on this and make an interactive map out of it. It would be great if we could play around with it together throughout the workshop. We are currently launching a new version of the KS toolkit. Developped as a wiki, it has expanded to a huge amount of tools and methods. Join us in creating and growing this resource of knowledge sharing tools and methods. While these are applicable in a wide range of contexts, we hope that together we can help frame them in the context of international development with a focus on agriculture. This toolkit would not be possible without the collaboration and earlier work of our colleagues at CARE, ODI, KM4Dev, FAO and many of the wonderful KM practitioners around the world. Most participants who so far filled out the pre-workshop survey are working in the area of communications, but capacity building, IT, and research are also and equally represented. When asked about their expectations, most participants are looking for a better understanding of KS tools, methods, and processes. But the expectation of networking and sharing among like-minded colleagues is almost as important. 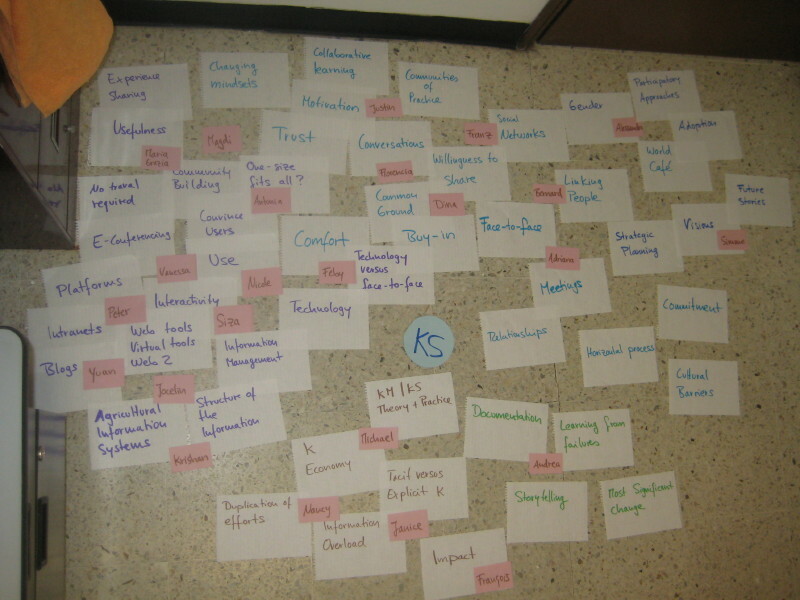 Furthermore, participants would like to acquire specific skills, understand which KS tool or method to apply to specific user groups, and get a more general overview of KS theory and practice. Fewer users are looking for input to KS strategy development. Participants want to learn how to use KS tools and methods effectively. They want their project / research / organizational / Web-based communication become innovative, better, and different. The Knowledge Sharing Project of the ICT-KM Program is proud to announce the active participation of the Forum for Agricultural Research in Africa (FARA) in the upcoming Knowledge Sharing Workshop. 15 FARA staff and focal points of the Regional Agricultural Information & Learning System (RAILS) will participate in the event, that will held its face-to-face meeting early May 2008 in Addis Ababa, Ethiopia. “Our particular interest in this workshop is how to strengthen the RAILS’ team capacity to facilitate knowledge sharing among and within national RAILS network and our main expectations are that key RAILS team are capable of sharing their lessons learnt from this exercise to their fellow network members as well as document their learning appropriately that can facilitate dissemination”, states Myra Wopereis-Pura, the RAILS coordinator. The workshop is now fully booked with 40 participants for its on-line phase and around 22 participants for the face-to-face meeting. We warmly welcome all 21 participants from CGIAR partner organizations, our colleagues from FAO, as well as the 19 CGIAR staff. The Workshop starts with a first on-line phase on March 24.